Do you have what it takes to start a successful small business? Financing is a vital part of starting a small business, however, there are many other factors to consider. Here are some of the most common traits of entrepreneurs who have been successful as small business owners. Driven: A su ccessful small business owner has the tenacity and motivation to go into business and give 100 percent to build and grow the business. They are driven to find the to find funding for the business by finding investors, loans and looking all options, including non-traditional small business financing. Goal oriented: A successful small business owner keeps his eyes on the end goal. They have a vision for the company and the future. This refers not only to growing the business, but also continuing to find financing when more money is needed for the growth of their business. The small business owner is open to non-traditional small business financing such as factoring, as another option to reaching important long and short-term goals. Confident: Successful small business owners are self-assured, earn respect and trust, and take confident command of a situation. Passionate: Successful small business owners are passionate about their business. 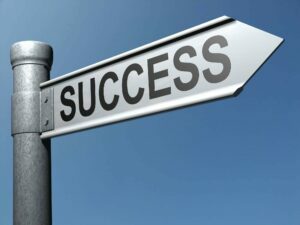 Striving for success keeps a small business owner motivated, present and engaged in their business. Budget minded: A small business owner is dedicated to keeping costs down and spending money wisely and conservatively. A successful business owner investigates options for loans, business credit cards, and other types of financing such as invoice factoring and other non-traditional small business financing. Self-Reliant and Decisive: Successful small business owners are able think and act independently of others. They are confident in making large and small decisions for the business. Resilient: Successful small business owners are able to overcome set-backs. They identify the problem and do what is necessary to find a solution. Focused: Successful small business owners able to focus on the task at hand. They have the focus and discipline to get the job done. Open-Minded: Successful small business owners are open to new ideas. They will look at all options for the right solution. They are open-minded about different types of financing. They will find the best option in traditional loans and credit, or seek out non-traditional small business financing like invoice factoring. Proactive: Successful small business owners are always looking for new opportunities to grow and improve their business. Proactive small business owners solve problems before they even happen, such as improving cash flow and profitability using non-traditional small business financing. Collaborative: Successful small business owners work with others, effectively delegate, and build strong relationships that enhance their business and success. Technically Aware: Successful small business owners find the right technology solutions for their specific business. They know that the right software is crucial for their business to run smoothly and best serve their clients. Energetic: Successful small business owners have the energy to manage long hours and take on a lot of responsibility. They know that a business is a full-time, long-term commitment. Risk-Takers: One trait all successful small business owners have in common is that they are not afraid to take a risk. Accountable: A Successful small business owner takes responsibility for both the accomplishments and failures. Trustworthy: A successful small business owner builds trust and trustworthy relationships. When signing contracts or obtaining a loan or non-traditional small business financing, it is important that others be able to trust you. Forward Thinking: Successful small business owners take creative ideas and make them a reality. If you identify with a lot of these character traits, chances are you have what it takes to be a successful small business owner. Never underestimate the power of determination, hard work, and getting some non-traditional small business financing help when you need it. American Receivable has been helping small business owners with non-traditional small business financing for 40 years. Through invoicing factoring, American Receivable is able to assist small business owners by improving cash flow, thus providing the financial resources needed to grow, increase inventory, make payroll on time and effectively compete in the marketplace. Call American Receivable today at 1-800-297-6652, complete an application for factoring online, or visit our click here to learn more about how the best invoice factoring company can help your small business.